While Tallinn Airport will never be the largest airport in the world, then it certainly strives to be one of the best airports in the world. The whole airport's design and its many features follow a simple philosophy – to be the cosiest airport. This is an experience for all senses and is evident in the multitude of minute details, with close attention paid to ensuring the passenger's well-being throughout the entire stay at the airport. The airport is modern, clean and efficient, yet maintains the feel of being in the comfort of one's own living room. The sense of place aims to offer a calming surrounding to alleviate pre-flight stress and put the passenger completely at ease. Owing to its compact size, the layout is logical and all gates are reachable within just five minutes from the security checkpoint. But as always, it's the little things that matter the most. Being home to a variety of different cafes, restauraunts, bars and shops, Tallinn Airport offers a diverse selection of activities for spending time waiting for the flight. Even though the airport is located a mere 4 kilometres from the city centre, it is advisable to come to the airport slightly ahead of time to explore what possibilities the airport has to offer. Accessing the airport from the city is easier than anywhere else – there is ample parking available outside the terminal, the tram connects the city with the airport in just 20 minutes and a taxi ride should not cost more than 10 euros. Tallinn Airport truly deserves a special mention for being one of the closest airports to the city centre anywhere in the world. Why not play a game or stretch a bit? Having cleared the security checkpoint (which offers fantastic views of the runway), you are greeted by the smell of perfume, freshly baked bread and excellent coffee. Tallinn Airport's shops are perfect for last minute shopping to make sure your loved ones back home can expect a unique souvenir as a present from your trip to Estonia. Look for a wide selection of Estonian handicrafts and foodstuff at Hää Eesti Asi in its new location next to gate number 3. And make sure to try amazing coffee at Kohver coffee shop or enjoy possibly the best selection of champagnes by the glass in the comfort of the wine bar Rosin near gate 9. But the airport experience is not only about the shops and the cafes – there are other activities for travellers as well. If you're feeling competitive, then challenge your friends to a game of chess near gate 8 or to a game of table-tennis across from wine bar Rosin. Kids can have a ball in the Lottemaa children's play area next to gate 5. And those looking to shed a few calories after enjoying the finest Estonian cuisine during their trip...Tallinn Airport has something very unique to offer you. At gate 6 you can use treadmills and other exercising equipment at the first pop-up airport gym in Europe. The myFitness gym area is great for stretching and getting 10 minutes of exercise, but don't overdo it, as there are no showers available. 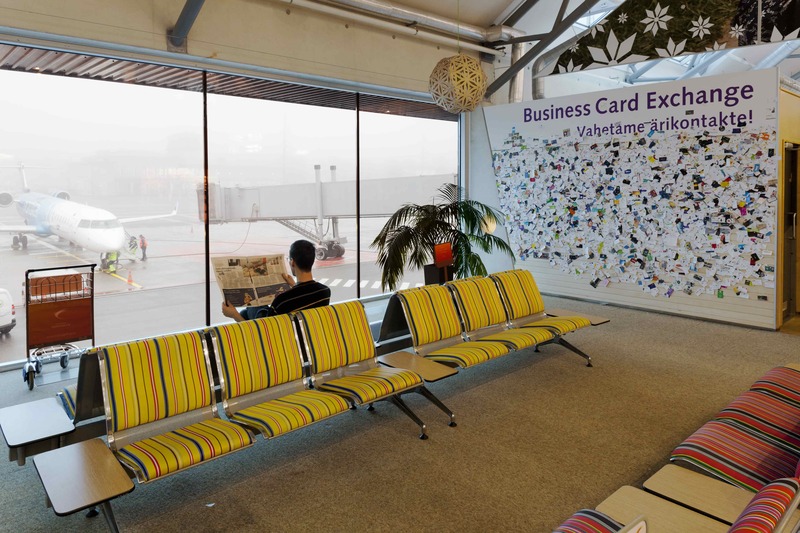 Tallinn Airport was also one of the first to introduce an airport library. You are welcome to take a book along for your trip and bring it back when you return. If you didn't manage to finish the book while away, you can also take it home and return it some other time. Our library operates purely on trust. Another unique feature at Tallinn Airport is the possibility to treat yourself to a late-night snack when arriving late at night after the cafes have closed – there is a small do-it-yourself catering area near Take-Off One restaurant, where famished passengers can make a sandwich and leave a small donation in return. Tallinn Airport's wifi connection has been deemed as the best among European airports and second best in the world, according to wifi access portal RottenWiFi. Free internet access is available throughout the airport terminal and is completely free of charge. There are plenty of charging points scattered around the different gates, each with their own unique style and furniture. The entire airport is a great place for catching up with your e-mails or making those last-minute conference calls before boarding. And naturally, there is a business lounge as well, although the name could be somewhat misleading. Based on passenger feedback, it certainly doesn't have a very office-like feel, but rather offers the comfort and tranquility of the lounge of a great design hotel. It's a great place for working, but has much to offer to others as well. There's a children's play area, massage chairs, sleeping pods, an outdoor terrace and an office corner. Lounge customers have been very satisfied with the cleanliness and relaxing atmosphere of the lounge, complimenting also on the friendly service and great selection of snacks and beverages available. The lounge is located on the second floor of the terminal, immediately to the left after passing through the duty-free shopping area. A visit to the lounge is particularly recommended when taking early morning flights – the sunrise you can see on a clear day from the lounge windows is simply stunning! The feeling of cosiness is of course highly subjective, but Tallinn Airport strives to make sure that everyone feels at home there. International travel portal Sleeping in Airports has ranked Tallinn Airport as 3rd best airport in Europe in both 2016 and 2017, based on customer feedback. And there have been confirmed reports of people travelling to Estonia just to see this great little airport alone. It's the perfect place to say both „hello" and „goodbye" to Estonia. Welcome to the cosiest airport! Join the Estonia 100 celebrations! Take part in Estonia’s 100th anniversary with international events, a language game and more.